Rumors and whispers of the Next Great American Formula One Team come and go, often crumbling like bits of Pirelli rubber in the wind. But while the Haas F1 team actually looks like it’s coming to fruition, there’s another murmur, this time dancing through the ears of Motorsport.com. And this one looks to be based on a buy-out. The prospective team is reportedly backed by two guys, Tavo Hellmund and Jim Carney, and the plan, according to Motorsport.com’s sources, is to put up a bunch of money and acquire one of the struggling teams. All signs point to it being the most-struggly team of all, the Manor Marussia team, which is currently milling around the back of the pack with what is fundamentally an old chassis and an old engine. 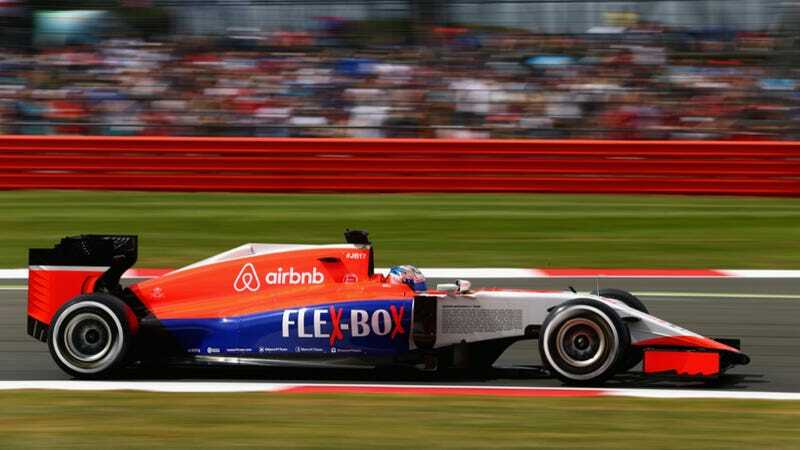 Manor Marussia was in such dire financial straits late last year that it was actually forced to put a lot of things up for auction, before being brought back from the brink of death by Irishman Stephen Fitzpatrick, founder of small utility company Ovo Energy. But running an F1 team is as expensive as hell, so Fitzpatrick’s been looking to sell a bit of the team for extra cash. Hellmund and Carney, however, reportedly want a majority stake. So who are Hellmund and Carney? Well, Tavo Hellmund has done some racing on his own, and is generally regarded as one of the main people responsible for bringing F1 back to the U.S. in Austin, and also back to Mexico. You can read big profile that Forbes did on him here. And as for Carney, well, we haven’t been able to find much. The Motorsport.com report dubs him a “New York financier,” though no one named James or Jim Carney involved in the New York financial world seems to have any real connection to the sport. We did, however, find this photo of him at the race in Texas last year. The photo caption simply lists him as “Jim Carney of New York.” He’s just... of New York. Borne of the city itself, a physical manifestation of its various energies. We wish them all the best of luck in 2016!!!!!!! !